Board cites "strong violence" as the reason behind Skyrim's rating. 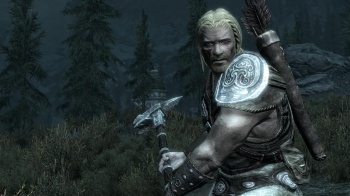 Skyrim, the upcoming fifth installment in the Elder Scrolls series, has been awarded a 15 rating by the BBFC. Unlike the ratings from the ESRB in North America, which are technically only advisory, the BBFC ratings are enforceable by law, with UK retailers facing stiff fines if they sell to anyone under the age of 15. According to the BBFC listing, Skyrim's rating is, at least in part, down to the "strong violence" the game contains. This is actually a step up from Oblivion, which the BBFC considered to only have "moderate violence" back in 2006. Sadly, the BBFC ratings aren't as detailed as their ESRB counterparts, so there are no other details to pluck from it other than it has violence in it, and, let's face it, that's a detail that we already knew. I'm curious to see what has prompted the upgrade from moderate to strong violence. If I had to guess, I'd say that it was the VATS-style, slow motion kill animations that Bethesda has added to the game are responsible, because most of what we've seen of the fighting so far doesn't look that different from Oblivion in terms of how graphic it is. Elder Scrolls V: Skyrim comes out for PC, PS3, and Xbox 360 on November 11th.